In an online chat, SLP Erin Mauldin discusses how to teach students with ASD strategies for understanding and responding to bullying. Participant: Would you give an example of backhanded bullying? Erin Mauldin: Backhanded bullying happens when someone uses kind gestures or words with the intent of misleading their victim. 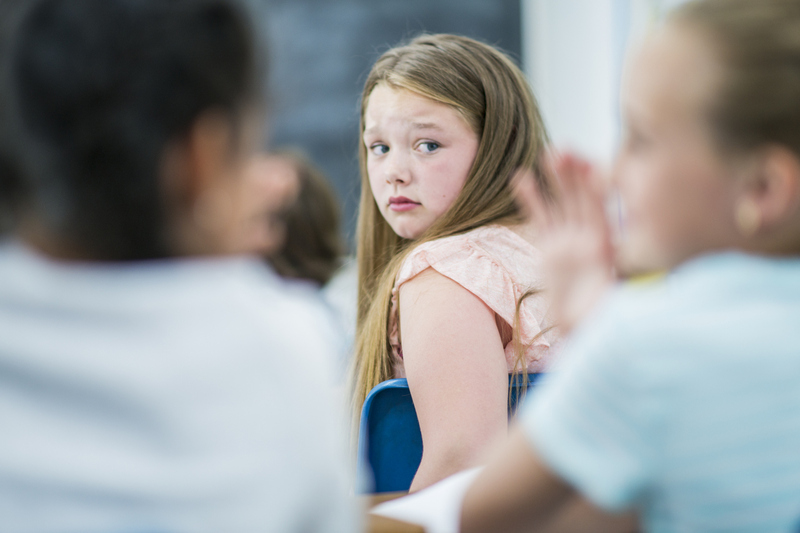 A bully may say something in a nice or kind manner but the message may be negative, which our students who lack social skills are sometimes unable to interpret. A bully may take advantage of their lack of understanding to trick them into a negative situation. Participant: Is there any research about whether to talk with and support the bully in these situations? Mauldin: A lot of the research I found was about talking to the victim of bullying and providing proactive support to help them cope with bullying. But research does also support talking with the bully. A lot of times bullies have something negative going on in their own lives, so we certainly shouldn’t ignore them. I don’t have specific examples of research supporting talking directly to the bully. We can always refer these students to the school counselor for further help. Mauldin: Research shows that students with ASD who experience repeated bullying often interpret non-bullying events as bullying situations and then become so-called “tattletales” to report what they consider extreme events of bullying. You can help this student through role-playing situations that are bullying versus episodes that are not bullying, so that she can learn the difference. You can also try teaching her the exact definition of bullying. But role-playing and seeing the difference between bullying versus non-bullying would be a great place to start if you can get her in a small group or one-on-one setting. This student may also need some counseling herself in order to cope with her past bullying experiences. Participant: What are key components in an anti-bullying program for students with special needs and/or ASD? Mauldin: One example of a good anti-bullying program that I’ve seen used in lot of schools is Positive Behavioral Interventions and Supports (PBIS), and you can find a lot of good information about that here: https://www.pbis.org/. But for targeting special needs and/or ASD specifically, I would incorporate some peer-sensitivity training so that typically developing peers are able to understand and support their peers with special needs. I’m going to give a shout out to another presenter in this conference and suggest you watch Jed Baker’s presentation “Key Components of Social Skills Training” (click here for the chat transcript following this presentation) for more specific information on peer sensitivity training to help with anti-bullying efforts. He has some great information! Participant: When teaching strategies to help against bullying, do you recommend a direct approach or a more symbolic approach? Mauldin: I think that depends on the comprehension level of the students with whom you’re working. Some students may need the information to be straightforward so that they can understand what we’re trying to tell them, but others may be able to comprehend more symbolic examples. You can always try out multiple methods with students, and if one doesn’t work, try another. Participant: I recently had a conversation in a treatment session with a student about an exchange he had with another student on his way to speech. We discussed his reaction and how he could have managed his reaction. I made it clear that any time you feel bullied, you should let your teacher know. We talked about staying in control and making it easy for others to see the instigator versus an over-the-top behavior response. Sometimes our students’ responses interfere with appropriate responses from bystanders. Mauldin: You’re right, sometimes students’ responses can interfere with appropriate responses from bystanders, which is why helping them understand appropriate ways to respond (as you did) is a perfect example of something we can do in therapy sessions to address bullying. Participant: Do you find frequent unintentional adult bullying toward students due to a lack of understanding of ASD? Mauldin: In most situations, it probably is a lack of understanding, which is why holding training sessions for peers and adults in the school can be beneficial for everyone. Our role as professionals working with students with special needs and ASD makes us particularly good candidates for helping other adults understand students on the spectrum so that these negative behaviors can be avoided. Participant: I have noticed that some of my students with ASD are not likely to gain support from adults and may even be seen as the bully due to their intense emotional reactions. These students often do well in role-playing activities but have trouble generalizing due to out-of-control emotions. Any advice in these situations? Mauldin: Generalization can be difficult for these students. In these situations, I would suggest following up with parents and trying to get parents on board for working on social skills and role-playing at home, too, so that the ideas generalize to more areas than just the speech therapy room and then hopefully start to generalize to other situations from there. But also help adults in school understand why these students are having intense emotional reactions. They may just not understand the situation. Participant: In my experience, I have teachers and counselors who state that they believe the student with ASD is “lying” about their report of being bullied. Mauldin: Unfortunately, that can be very common among adults who just don’t understand the nature of ASD or if it’s coming from students who have become notorious for being so-called “tattletales.” But that doesn’t mean that an allegation of bullying should ever be overlooked. In this situation, I may take a prime role in the situation to investigate what happened so that the student doesn’t feel ignored, but also, again, try to help the adults understand the nature of ASD and what they can do to help these students just as they would help anyone else. Participant: Could you comment on what our role might be for students who have experienced bullying in the past? In this particular situation, the student reported that the bullying has since stopped, but that she still does not feel comfortable around the student that targeted her. Is there anything we can do to help with that situation? Mauldin: In this situation, I would make sure other adults who work with this student are aware of the situation and refer her to the school counselor to talk about how she’s feeling and determine ways to cope with the situation and feel comfortable around this student again. Participant: We had a student move to our district and he will often refer back to being bullied in his previous school. He says that he is not bullied here and that he is popular, but his sense of perspective is off. He meets with our school psychologist on a weekly basis. Knowing that victims may lack a sense of interpreting true bullying, I’m not sure how to respond. We work on his current goals (perspective-taking, flexible thinking, social curiosity, etc.) and I informed the school psychologist about my student’s comments. Any thoughts? Mauldin: It sounds like you’re doing all the right things! I would be working on perspective-taking and other social skills goals as well and would have the school psychologist involved. It sounds like you are doing just what you should be for this student. Participant: Do you have any experience with parents who are also on the spectrum or appear to demonstrate a lot of the same behaviors? Mauldin: I have experienced a few parents who I suspected were probably on the spectrum but were not diagnosed. Those can be tricky situations because we can’t overstep, and our focus should remain on the student. It can be tricky when the parent doesn’t quite understand what’s going on either and is unable to help their children at home, though. I’m still not completely sure what to do in those situations—just provide as much support as possible at school. Participant: I have heard repeated complaints in our school district from parents who believe that children “get away with” harassment and bullying because they have a diagnosis and/or IEP. I agree with you that adults need more education on the topic. Have you approached the administration about training for parents? Mauldin: I think such a training would be appropriate, because educating the parents will (hopefully) help educate students as well. However, I haven’t directly experienced this so far and I can see how it may be difficult to gather parents together for such a training. You could try sending home information in pamphlets and hope that parents read them if a formal training isn’t possible and if your principal is on board with that. Participant: What are the most important tips participants should consider as they think about implementing your suggestions with their students? Mauldin: Always remember that students deserve to be heard, no matter their ability level, and try implementing strategies discussed to be proactive in bullying situations, so that students know they are being supported. And don’t be afraid to address your administration about adult and/or peer training if you believe it would benefit the school.